The American Farm Bureau Federation (AFBF) and National Pork Producers Council (NPPC) formally appealed a lower court ruling that allowed the U.S. Environmental Protection Agency (EPA) to publicly release information regarding livestock farms subject to concentrated animal feeding operation (CAFO) regulations. The appeal was filed April 24, in the U.S. Court of Appeals for the Eighth Circuit. It seeks to reverse a Jan. 27, 2015 ruling by U.S. District Judge Ann Montgomery, in the U.S. District Court for the District of Minnesota (Case No. 15-1234). The ongoing legal battle stems from the 2013 EPA release of CAFO database information to three environmental advocacy groups under Freedom of Information Act (FOIA) requests. EPA released personal information about tens of thousands of livestock and poultry farmers, ranchers and their families in multiple states. The database included the names of farmers, ranchers and sometimes other family members, home addresses and GPS coordinates, home telephone numbers and personal emails. In July 2013, AFBF and NPPC filed an injunction in the U.S. District Court for the District of Minnesota to block EPA from publicly releasing additional data under FOIA requests until a court could clarify EPA's obligation to keep personal information about citizens private. However, in her ruling on Jan. 27, Judge Montgomery dismissed the case, concluding the farm groups lacked standing because the information released by EPA was already publicly available, and that CAFOs had yet to see any injury due to the release of the information. By dismissing the suit, Judge Montgomery ruled that farmers are not harmed when the government compiles and releases a storehouse of personal information, so long as individual bits of that information are somehow publicly accessible, such as through an Internet search or on a Facebook page. Shortly after the ruling, AFBF appealed the case dismissal, and requested – and received – a stay preventing EPA from releasing any more personal information until the case was resolved. In its latest appeal, AFBF said the ruling failed to address key privacy issues, creating "a palpable threat to privacy." "Personal information is ubiquitous on the Internet; if the mere appearance of information on a website destroyed any continuing privacy interest in that information, privacy would be dead. The Supreme Court's FOIA precedents foreclose that conclusion," the brief stated. According to the brief, EPA's disclosure of the requested information serves only one purpose: "to put in the hands of environmental activists information that will help them to investigate and harass family farms on their own, in their efforts to bring private lawsuits against family farmers." In addition, the brief states that farms and ranches are inherently different from other businesses, because nearly all are home-based. "Most businesses" mailing addresses lead to offices or factories; their telephones are answered by receptionists and secretaries; and their GPS coordinates point to parking lots or security-guard booths," the brief states. "But family farms are fundamentally different – for the great majority of them, their businesses are their homes. Their driveways lead not only to their fields and their hen houses, but also to the swing sets where their children play. Their business telephone numbers are answered not by nameless receptionists in florescent-lit offices, but by their spouses in their family kitchens, and their children in their upstairs bedrooms. 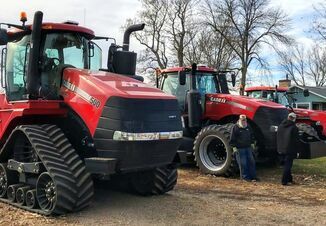 "If anything, the fact that the disclosed information concerns farmers as both individuals and businesses is a greater reason to find the information protected, not the other way around." Long term, the case stems from EPA oversight of CAFOS through National Pollutant Discharge Elimination System (NPDES) regulations, dating back to about 2000. On 2008, the General Accountability Office issued a report concluding EPA did not possess reliable information it needed to identify and inspect CAFOs. In October 2011, EPA published a proposed CAFO reporting rule, which would have required all CAFOs nationwide to submit basic information to EPA; or required EPA to collect basic information from CAFOs in specific watersheds. The proposed rule would have allowed EPA to collect information, like locations and animal population sizes, and make it publicly available and readily searchable through an EPA website. Farmers, agricultural organization, USDA and even the Department of Homeland Security expressed concerns that the proposed rule was not only a serious overreach of EPA's authority, but would create a road map for activists to harass individual families, and aid and abet terrorism and provide a threat to the nation's food security. EPA withdrew the proposed rule in July 2012, saying it was more appropriate to obtain CAFO information from existing sources, including USDA and state agencies already collecting the information. In fall of 2012, environmental advocacy organizations submitted FOIA requests, seeking the release of information EPA already had on reporting CAFOs. In January 2013, EPA released data containing personal information about thousands of livestock and poultry farmers and ranchers in about 30 states. The National Cattlemen's Beef Association (NCBA) also said it was notified by EPA that CAFO information released through a FOIA request included many family farmers and ranchers who feed less than 1,000 head and were not subject to regulation under the Clean Water Act. After the initial release, EPA attempted to recall some of the records, replacing it with a new set of data after redacting some of the personal information. However, one of the environmental advocacy groups, Food &; Water Watch, said it would retain all original records.